As Indian Prime Minister Narendra Modi starts his three-day official visit to Japan on Thursday, he will be expecting to see the already close bilateral relationship rise to a new height, with several major deals set to be inked. Among them will be a civil nuclear cooperation agreement, which allows Japan to export its nuclear plant technologies to India, and one on India's purchase of 12 amphibious rescue aircraft from a Japanese manufacturer worth up to $1.6 billion. These deals are especially significant given that India has yet to ratify the international Non-Proliferation Treaty, and that the aircraft deal will be one of Japan's first sales of military equipment since it lifted a 50-year ban on arms exports. The very good personal chemistry between Modi and Japanese Prime Minister Shinzo Abe is said to have played a part in deepening relations between the two nations. It is reported that Modi is one of the few people Abe follows on Twitter. Modi, on his part, first visited Japan back when he was chief minister of India's Gujarat province. It would be just another diplomatic anecdote if it stopped there. Yet some have tried to describe the visit as a mutual effort by New Delhi and Tokyo to "counter an assertive China", or "to keep a rising China in check". They hope that an anti-China alliance could be forged between the world's second most populous nation and third-largest economy, because of China's longstanding territorial dispute with India and its spat with Japan over the Diaoyu Islands in the East China Sea. People with such thinking have too simplistic an idea of international relations that are not a zero-sum game. 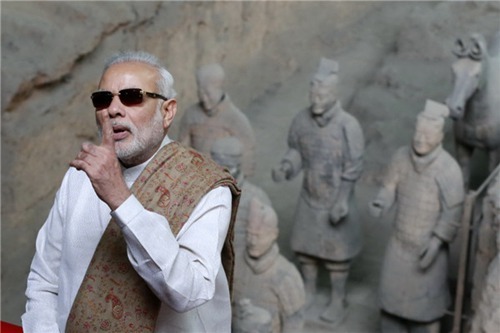 Modi has always sought "to lead India's foreign policy with its economic interests in mind". And Japan's trade with India is still less than a quarter of that between India and China. China, as the top trade partner of both, is more than happy to see deepened economic, trade and political relations between its neighbors if they contribute to peace and stability in the region. While some in Japan may continue to trumpet "the rule of law in the South China Sea" or "freedom and openness in the Indian and Pacific Oceans", as Abe did with Modi in September on the sidelines of a meeting of the Association of Southeast Asian Nations in Laos, Sino-Indian relations are strong enough to withstand differences and external interferences.